A digital camera uses an array of millions of tiny light cavities or "photosites" to record an image. When you press your camera's shutter button and the exposure begins, each of these is uncovered to collect photons and store those as an electrical signal. Once the exposure finishes, the camera closes each of these photosites, and then tries to assess how many photons fell into each cavity by measuring the strength of the electrical signal. The signals are then quantified as digital values, with a precision that is determined by the bit depth. The resulting precision may then be reduced again depending on which file format is being recorded (0 - 255 for an 8-bit JPEG file). 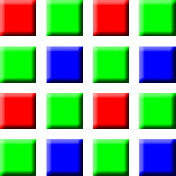 However, the above illustration would only create grayscale images, since these cavities are unable to distinguish how much they have of each color. 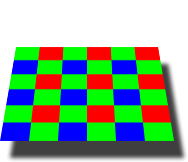 To capture color images, a filter has to be placed over each cavity that permits only particular colors of light. Virtually all current digital cameras can only capture one of three primary colors in each cavity, and so they discard roughly 2/3 of the incoming light. 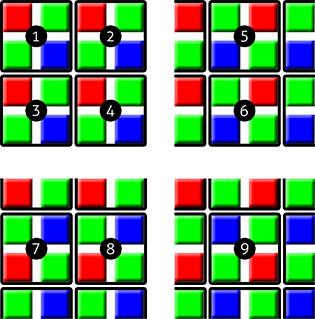 As a result, the camera has to approximate the other two primary colors in order to have full color at every pixel. 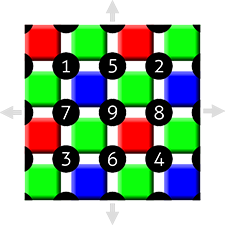 The most common type of color filter array is called a "Bayer array," shown below. Two separate photos are shown above—each at a different magnification. Note the appearance of moiré in all four bottom squares, in addition to the third square of the first photo (subtle). 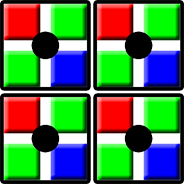 Both maze-like and color artifacts can be seen in the third square of the downsized version. These artifacts depend on both the type of texture and software used to develop the digital camera's RAW file. 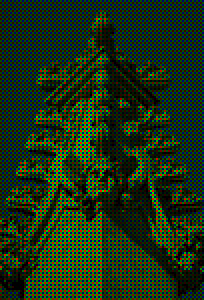 However, even with a theoretically perfect sensor that could capture and distinguish all colors at each photosite, moiré and other artifacts could still appear. This is an unavoidable consequence of any system that samples an otherwise continuous signal at discrete intervals or locations. For this reason, virtually every photographic digital sensor incorporates something called an optical low-pass filter (OLPF) or an anti-aliasing (AA) filter. This is typically a thin layer directly in front of the sensor, and works by effectively blurring any potentially problematic details that are finer than the resolution of the sensor. You might wonder why the first diagram in this tutorial did not place each cavity directly next to each other. 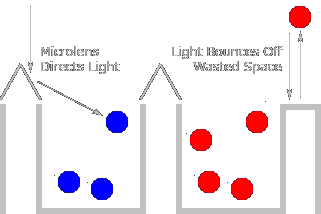 Real-world camera sensors do not actually have photosites which cover the entire surface of the sensor. In fact, they may cover just half the total area in order to accommodate other electronics. Each cavity is shown with little peaks between them to direct the photons to one cavity or the other. Digital cameras contain "microlenses" above each photosite to enhance their light-gathering ability. These lenses are analogous to funnels which direct photons into the photosite where the photons would have otherwise been unused. Well-designed microlenses can improve the photon signal at each photosite, and subsequently create images which have less noise for the same exposure time. Camera manufacturers have been able to use improvements in microlens design to reduce or maintain noise in the latest high-resolution cameras, despite having smaller photosites, due to squeezing more megapixels into the same sensor area.